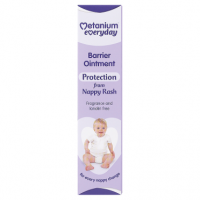 Apply at every nappy change to help protect your baby against the causes of nappy rash, and when required to support gentle skin recovery. See in-pack leaflet for further information. Bepanthen Nappy Care Ointment works in two ways to protect from the causes of nappy rash and care for your baby's delicate skin. Bepanthen works by forming a transparent, breathable layer, helping to protect even the most delicate skin from irritants and rubbing. Bepanthen is so gentle, it can be used at every nappy change to help the most sensitive of skins, including that of premature babies. Bepanthen contains Provitamin B5 which gently helps sensitive skin to repair its natural protective barrier while keeping it soft, smooth and moisturised. The water-in-oil formulation seals in the skin's natural moisture and provides optimal conditions to allow gentle skin recovery without drying out your baby's delicate skin, keeping it healthy and hydrated. Store in a cool dry place below 25 C.
Please Note: Whilst we (Doorstep Pharmacy) make every effort to ensure that all information is up to date, the information shown on this page should not replace the advice of a medical professional, and you should always refer to the patient information leaflet before taking any medication.